You have the maps and have just experienced a superlative ride through the Ozark hills. Now envision that special resort where you and your riding buddies can get together and compare the remarkable rides through the scenic Ozark hills; share a meal; attend a tech session; and tuck you bike into its’ own covered and locked parking bay. 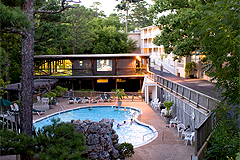 The Best western Inn of the Ozarks Resort and Convention Center provides just such a venue. You can work out the kinks in the pool or hot tub, challenge a buddy to a friendly game of basketball or get the group together for a round of volleyball. The poolside, covered Pavilion is the perfect spot to gather and chat with your friends as you relax after a day of riding and reflect on the highlights of your ride. After a soothing rest in one of our 122 deluxe guest rooms, Myrtie Mae’s Restaurant is the perfect spot to get your day started with a wholesome and satisfying breakfast. 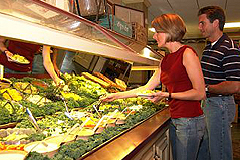 This award-winning restaurant can also accommodate your party for an informal, relaxed dinner. We have had the privilege of hosting several national Motorcycle Rallies, including the Valkyrie Riders, Concourse Owners Group and more. The convention center at the Inn of the Ozarks can easily accommodate training sessions, trade show (large or not-so-large) exhibit space and a banquet. 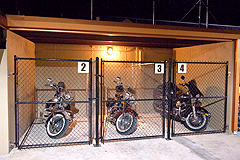 The parking lot at the center provides a nice venue to show off your motorcycles with parking for 500 bikes, or perhaps hone riding skills with a “Parking Lot Poker Run”. Rally planners will receive the very best support from the professional Sales team at the Inn of the Ozarks, including assistance in planning on-site events and help with overflow housing and coordinating local attractions. We are your Eureka Springs resource to help you plan the most successful rally.